Guest post by Daniel Nethery and Emmanuel Vincent Daniel Nethery is the associate editor and Emmanuel Vincent is the founder of Climate Feedback. Climate Feedback is launching a crowdfunding campaign today. The internet represents an extraordinary opportunity for democracy. Never before has it been possible for people from all over the world to access the latest information and collectively seek solutions to the challenges which face our planet, and not a moment too soon: the year 2015 was the hottest in human history, and the Great Barrier Reef is suffering the consequences of warming oceans right now. Yet despite the scientific consensus that global warming is real and primarily due to human activity, studies show that only about half the population in some countries with among the highest CO2 emissions per capita understand that human beings are the driving force of our changing climate. Even fewer people are aware of the scientific consensus on this question. We live in an information age, but the information isn’t getting through. How can this be? While the internet puts information at our fingertips, it has also allowed misinformation to sow doubt and confusion in the minds of many of those whose opinions and votes will determine the future of the planet. And up to now scientists have been on the back foot in countering the spread of this misinformation and pointing the public to trustworthy sources of information on climate change. Climate Feedback intends to change that. 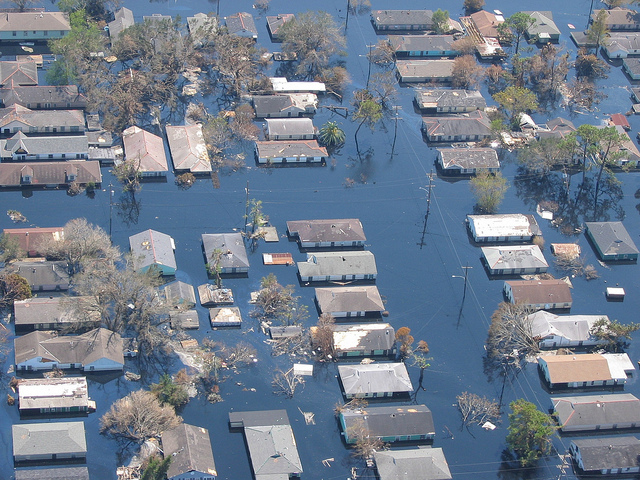 It brings together a global network of scientists who use a new web-annotation platform to provide feedback on climate change reporting. Their comments, which bring context and insights from the latest research, and point out factual and logical errors where they exist, remain layered over the target article in the public domain. You can read them for yourself, right in your browser. The scientists also provide a score on a five-point scale to let you know whether the article is consistent with the science. 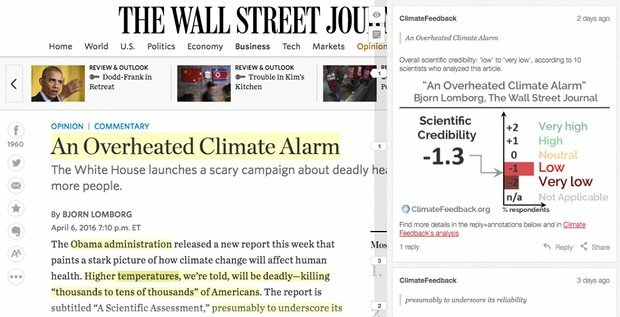 For the first time, Climate Feedback allows you to check whether you can trust the latest breaking story on climate change. Last year the scientists looked at some influential content. Take the Pope’s encyclical, for instance. The scientists gave those parts of the encyclical relating to climate science a stamp of approval. Other “feedbacks,” as we call them, have made a lasting impact. When the scientists found that an article in The Telegraph misrepresented recent research by claiming that the world faced an impending ice age, the newspaper issued a public correction and substantially modified the online text. But there’s more work to be done. Toward the end of the year the scientists carried out a series of evaluations of some of Forbes magazine’s reporting on climate change. The results give an idea of the scale of the problem we’re tackling. Two of the magazine’s most popular articles for 2015, one of which attracted almost one million hits, turned out to be profoundly inaccurate and misleading. Both articles, reviewed by nine and twelve scientists, unanimously received the lowest possible scientific credibility rating. This rarely occurs, and just in case you’re wondering, yes, the scientists do score articles independently: ratings are only revealed once all scientists have completed their review. We argue that scientists have a moral duty to speak up when they see misinformation masquerading as science. Up to now scientists have however had little choice but to engage in time-consuming op-ed exchanges, which result in one or two high-profile scientists arguing against the views of an individual who may have no commitment to scientific accuracy at all. Climate Feedback takes a different approach. Our collective reviews allow scientists from all over the world to provide feedback in a timely, effective manner. We then publish an accessible synthesis of their responses, and provide feedback to editors so that they can improve the accuracy of their reporting. We’ve got proof of concept. Now we need to scale up, and for that we need the support of everyone who values accuracy in reporting on one of the most critical challenges facing our planet. Climate Feedback won’t reach its full potential until we start measuring the credibility of news outlets in a systematic way. We want to be in a position to carry out an analysis of any influential internet article on climate change. We want to develop a ‘Scientific Trust Tracker’ – an index of how credible major news sources are when it comes to climate change. We’re all increasingly relying on the internet to get our news. But the internet has engendered a competitive media environment where in the race to attract the most hits, sensational headlines can trump sober facts. We’re building into the system a new incentive for journalists with integrity to get ahead. Some journalists are already coming to us, asking our network of scientists to look at their work. We want readers to know which sources they can trust. We want editors to think twice before they publish ideological rather than evidence-based reporting on global warming. On Friday 22 May 2016, more than 170 countries signed the Paris climate agreement. But this unprecedented international treaty will lead to real action only if the leaders of those countries can garner popular support for the measures needed to curb greenhouse gas emissions. The fate of the Paris deal lies largely in the hands of voters in democratic countries, and we cannot expect democracies to produce good policy responses to challenges of climate change if voters have a confused understanding of reality. Scientists from all over the world are standing up for better informed democracies. You can help them make their voices heard. We invite you to stand with us for a better internet. We invite you to stand with science. Victor Venema: I am also part of the Climate Feedback community and have annotated several journalistic articles when they made claims about climate data quality. It is a very effective way to combat misinformation. Just click on the text and add a short comment; Climate Feedback will take care of spreading your contribution. If you are a publishing scientist, do consider to join.